Show off your love for the classic video game Pac-Man with an absolutely awesome t-shirt. 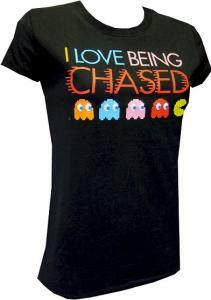 This t-shirt features the orange ghost, blue ghost, pink ghost and red ghost all chasing the yellow Pac-Man character with the saying above “I LOVE BEING CHASED”. Made to be very durable and super comfortable from 100% cotton this Pac-Man t-shirt is a juniors cut so it will hug the body and fit more slim, available in sizes Small to XLarge. Get this fun Pac-Man I love Being Chased T-Shirt.